The first Anglo-French rugby union match was held on March 22, 1906 at Parc des Princes in Paris. The traditional name for the annual England versus France rugby union match in the Six Nations Championship as used on both sides of the English Channel is Le Crunch, used since at least 1981. Games have also been played as Tests and at the Rugby World Cup. England and France have played each other on 101 occasions, England winning 55, France winning 39, and 7 matches have been drawn. Overall, England have scored 1,592 points, and France 1,269. In the World Cup, the teams have played on five occasions, with England winning three and France two; there have been no draws. In these games, England have scored 78 points, and France 64. In the Five Nations (1910–1999), England have played France on 70 occasions, England winning 36, France 27 and seven matches have been drawn. In these games, England have scored 889 points, and France 775. In the Six Nations (2000–present), England have played France on 16 occasions, England winning ten, France winning six, and no matches have been drawn. In these games, England have scored 360 points, and France 270. In other test matches, England have played France on nine occasions, England winning six, France winning four, and no matches have been drawn. Overall, England have scored 241 points, and France have 134. England had come into the 2003 World Cup as favourites, but up to the semi final their form was steady rather than spectacular. In the quarter final stages, France beat Ireland convincingly, whilst England stuttered to a victory over Wales. These results meant many thought France could spring a surprise and get to their second successive final. The weather on the day was heavy rain and torrential winds, which experts believed would fancy the English forward-dominated game, rather than the French free-flowing backs game. Jonny Wilkinson opened the scoring with a drop goal within the first ten minutes, before Serge Betsen scored a try after stealing a lineout. The try was converted by Frederick Michalak. Jonny Wilkinson is going to try a conversion. He scored four drop goals in semi-final in 2003, and did a brilliant performance four years later, again during a semi-final. The game soon swung back in England's favour, when French winger Christophe Dominici was sin-binned for a deliberate trip on Jason Robinson. Wilkinson added another nine points before half time, to give England a 12–7 lead. England continued to dominate in the second half, helped by an out of sorts Michalak missing his third penalty. Betsen became the second French player to get sin binned after a late challenge on Wilkinson, who converted the subsequent penalty. Shortly after Wilkinson made it a hat trick of drop goals. England wrapped up the game with another two penalties from Jonny Wilkinson and a final score of 24–7. The win put England into their first final since the 1991 World Cup, where they would play the same opponents Australia on their home ground. Afterwards, French captain, Fabien Galthie conceded that "England adapted to the weather better than us", whilst his English counterpart Martin Johnson said "we needed passion and it was a great display". Before the 2007 World Cup began, both defending champions England and last time semi finalists France were considered outsiders to win the tournament. England had stuttered through the group stages, losing 36–0 to South Africa but ended up second in the group. In the quarter finals, England caused a major upset by beating arch-rivals Australia 12–10, despite many pundits writing off their chances before the game. France also qualified a disappointing second from their group, after losing to Argentina. The French were also underdogs for their quarter final against pre-tournament favourites New Zealand. France ended up winning thanks to a disputed winning try by Yannick Jauzion. Despite beating the Wallabies, the English were still heavily tipped to lose, mainly because the French were expected to challenge more upfront. Five victories in the last six matches also meant that recent track record was in favour of France. England had not won in Paris since 2000. The game began 21:00 local time and within two minutes a box kick by English scrumhalf Andy Gomarsall was not dealt with by French full-back Damien Traille and Josh Lewsey capitalized with a try. 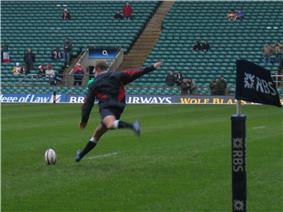 Jonny Wilkinson missed the conversion to the left. Two penalties before half time by Lionel Beauxis gave the French a slender advantage. Shortly after half time, Beauxis scored his third penalty to give France a 9–5 advantage. Minutes later, Wilkinson scored his first successful kick of the game to bring it back to one point. Wilkinson could have given England the lead, but his drop goal could only hit the upright. France also had a chance to score, when Vincent Clerc looked certain to score a try; however a last-ditch tap tackle by Joe Worsley prevented him from crossing the try line and kept England in the match. In the 75th minute, Wilkinson slotted in a penalty to give England the lead. Only three minutes later he scored another three points, this time through a drop goal, to give England a 14–9 lead, with only two minutes left. Despite heavy pressure from the French, England managed to hold on. After the game, England's manager Brian Ashton commented, "these guys won't give up. People talk about a British bulldog spirit and it is very much here in this group". The England captain, Phil Vickery also praised the team by saying, "to beat France, in France, in a World Cup semi-final is a huge effort from everyone". The French manager Bernard Laporte rued the missed try opportunity, noting "if we had scored that try we would have won the match, but we didn't". France had many difficulties during the pool stage. Indeed, the team of Marc Lièvremont, lost two matches, against New-Zealand and Tonga. So England was probably the best team before the beginning of the match. But rugby as a sport is very difficult to predict, and what happened on the field this day was unexpected. The first half was very difficult for England. France played very well and we did not see that since 2010 and the gran slam during the 6 nations. Dimitri Yachvili scored two penalties and Vincent Clerc scored the first try after many tackles failed by the English (22e). Dimitri Yachvili did not convert the try and France led 11 points to none. But it was not the half time and Maxime Médard scored a new try (30e). At the break, France led by 16 points to none because Yachvili failed, again, the conversion. The first half was very difficult for England. But the second was totally different from the first one. The men of Martin Johnson came back on the field this a different spirit. Indeed, Ben Foden scored the first points for England with a try (54e), converted by Jonny Wilkinson for his last match with England. This conversion was his last points for his country. The French team did not play has they did during the first part of the match and they scored only three points by a drop goal of François Trinh-Duc (73e). Mark Cueto scored, at last, a try (76e) but it was too late, the difference was too important this night between the two rivals team. As a symbol, Wilkinson failed the conversion, and France won the quarter-final by 19 points to 12. ^ The Irish Times, May 27, 1981, page 27.